Memory Map 2004 has arrived in school, but was it worth upgrading? In this review I'll focus on some of the new features, and make a few suggestions for classroom activities. 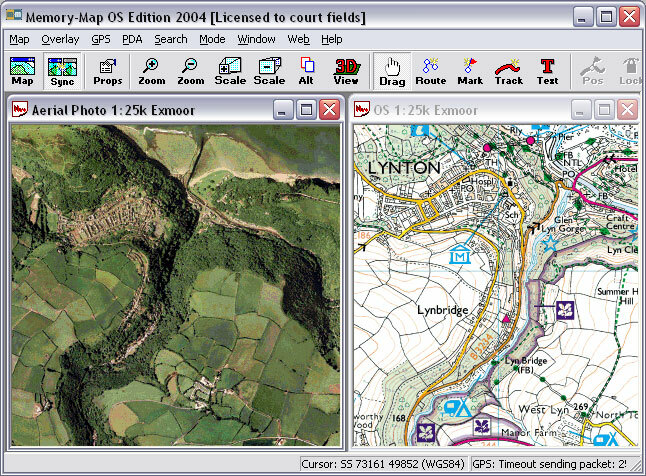 2004 brings additional coverage of National Parks in England and Wales at 1:25,000 scale together with aerial photograph coverage. Parts of Scotland are also available at 1:25,000 scale, and in the future it looks as though coverage of the rest of the UK will shortly follow. Our school bought 1:50,000 maps of the whole of GB, together with Dartmoor and Exmoor at 1:25,000. The Memory Map home page gives full information about pricing, educational licensing and map coverage. Installation was typically straightforward with the new software. A simple dialogue enquires as to whether maps should be copied to the hard drive. It's hard to see why you wouldn't want to do this, unless space is a pressing consideration. The whole process has been refined, and is faster and more intuitive than in earlier versions. Firstly a look at the Sync Windows feature, which allows you view two map windows at the same time. For the screenshot below, I loaded an aerial photo and 1:25,000 maps of Lynton which move simultaneously when panned or zoomed. This useful classroom feature may be incorporated into a number of learning activities involving map and photo comparisons. map reproduced from Ordnance Survey 1: 25,000 mapping © Crown copyright. All rights reserved. photo reproduced from Get Mapping © Get Mapping plc 2002. All rights reserved. 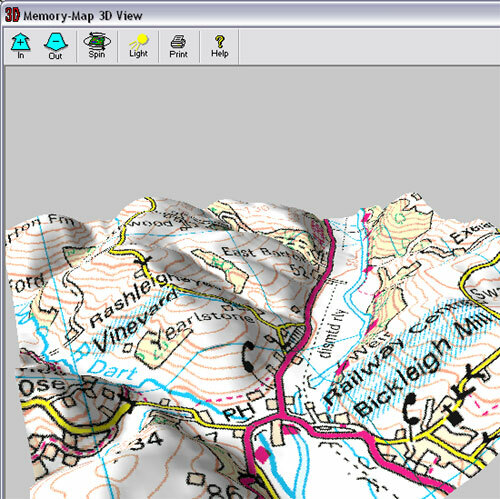 The 3D View feature transforms the view of any map for which elevation data is available (basically all the O:S mapping products). All sorts of teaching possibilities open up. The 3D view may be zoomed in or out and the vertical exaggeration multiplied as desired. An interesting feature allows the sunlight to be varied by passing the mouse from west to east across the rendered landscape. The whole image can be moved through all orientations by simple mouse movements, or left to spin through 360 degrees automatically. One can utilise the Fly Mode to pilot an imaginary plane through the 3D landscape, recording the flight as desired. To avoid disappointment, one needs to ensure that the intended PC or laptop meets the minimum specification for rendering 3D images. A Direct X 9 compliant 3D card is needed, (and this won't be found on many older laptops) See the Memory Map site for more information. 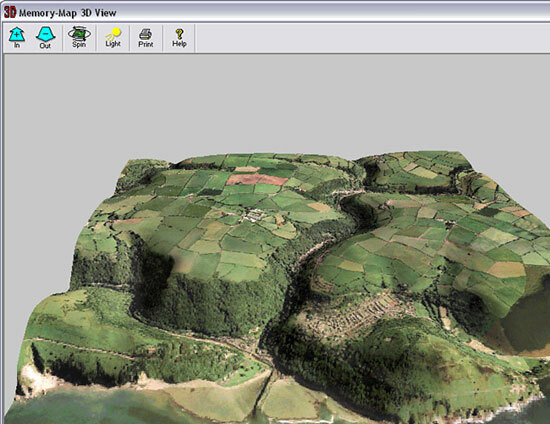 The 3D view is also available for aerial photos, as shown below. For classroom teachers, the final useful feature is TextNotes whereby information may be added to a map or photo as part of an overlay, and shown or hidden as desired. It remains possible to attach files created in other programs, for example text, spreadsheets, sounds, images or presentations as Memory Map Hotspots, to create a truly interactive map. The excellent elevation profile feature is also retained. Maps can be printed using relief shading or the standard view as desired, and at native scale the quality is virtually indistinguishable from published products. I assume that you are lucky enough to have a laptop running Memory Map, and a digital projector! The sunlight rendered in 3D view offers the opportunity to think about the best place to site a vineyard. I used the example of the vineyard near Bickleigh from the screenshot above. The TextNotes tool allows students to annotate features from the map or photo. For example in a glacial area, label the physical features, or use the map as part of a decision making exercise, for example the optimum site for a new reservoir. One can't print dierctly from 3D view, but it's perfectly possible for students to make a screenshot of the active window (ALT + Print Screen in Windows XP) and annotate the 3D image in another program. Project a contour map onto a screen and get students to quickly sketch a cross-section. Use the elevation profile feature, and allow self-assessment to take place. Eventually students should be able to visualise topography intuitively. Project an aerial photograph on to a whiteboard with MM in Sync Windows mode, and the accompanying map window minimised. Get students to draw a map from the photo directly onto the whiteboard, using O:S symbols if possible. Them turn off the photo and replace it with the map. How accurate was their map? Use MM in conjunction with a GPS and a PDA or laptop in the field. I've started to do this very successfully and produced a guide to GPS devcices and teaching ideas here. During urban transect - type activities, one can set a proximity alarm so that the PDA beeps when one enters a new survey area. Instantly add hotspots to a map via a PDA. Use the GPS to record waypoints that may for example, represent a pothole, or a particlar type of service. This technique was used as part of a local area investigation described here. The new version of Memory Map is better than before. The new features are not gimmicks, and the software represents a wonderful resource for Geography teachers. Make sure your PC is able to run the 3D view or you will be sorely disappointed!